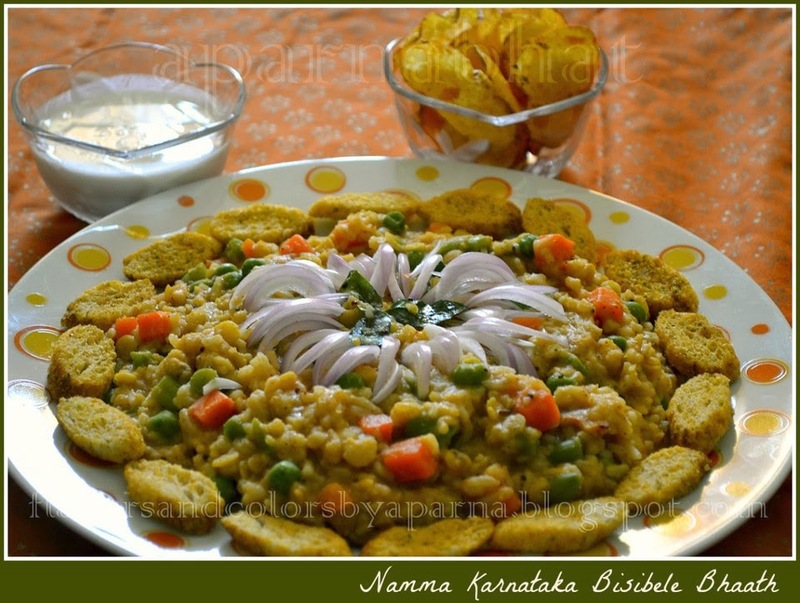 Namma Karnataka special Bisibele Huli anna aka Bisibele bhaath is favourite at our place. Tamarind golf-ball sized soaked in water, later juice squeezed out. Wash rice and dal separately. Place rice, dal [add 1/4 tsp turmeric powder and 1 tsp of oil] and vegetables in separate containers and cook it in pressure cooker up to 3 whistles. I prefer rice to be soft in this dish unlike other rice dishes. Mash the dal to smooth paste and mix it with rice. Meanwhile squeeze the tamarind juice and finely slice the onion. Now in a pan, heat ghee. Add mustard seeds, once they start popping add broken chilly pieces, peanuts [optional], asafoetida and curry leaves. Next add sliced onions and sauté it till they become soft. Add remaining turmeric powder, bisibele bhaath masala powder, jaggery, tamarind juice extract. Bring this to boil on a low flame for 5 minutes. Add salt and adjust as per the taste. Now mix in the cooked rice dal vegetable mixture. Stir it well [You can add water to adjust the consistency of the rice]. Continue stirring to prevent the mixture sticking to the bottom of the pan. Once it turns soft porridge like consistency, switch off the flame and garnish with roasted cashews. Serve it piping hot with ghee, fried cubed capsicum, chips, boondi or raita.